Of all nuts, cashews are the milkiest. They`re soft and creamy to begin with; Rude Health just roast them lightly to bring out their full nutty flavour, then combine them with spring water and a pinch of sea salt - and nothing else. At Rude Health, the only ingredients used are the kind of ingredients you’d have in your own kitchen; nothing artificial, nothing refined. They source their ingredients from fields, orchards and vines - not laboratories. They think food should be made out of food - not thickeners, preservatives, colourings, flavourings and other additives. The proof is in the taste, try it for yourself. When you`ve got food this good inside you, you`ll be up for anything. Natural Spring Water, Organic Cashews (5%), Sea Salt. Add to a smoothie, curry or hot chocolate. After opening, keep in the fridge and use within 5 days. 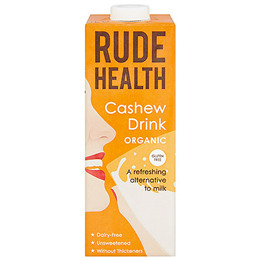 Below are reviews of Rude Health Cashew Drink - 1 Litre by bodykind customers. If you have tried this product we'd love to hear what you think so please leave a review.